One of my wife friends and I were talking and we both agreed that it can be difficult for families to ‘let-go’ and allow married couples to form and continue their own traditions for the holidays. When I was growing up, we always traveled for the holidays. When I was in undergrad, all of our family came to my dad’s house and that turned into hosting and running errands. With that, we are trying Advent this year and I am so excited! I am always looking for ways to incorporate focusing on and learning about the word of God into every Holiday as well as our daily lives so it seemed right up our alley. We (meaning me) researched all types of ideas for daily activities. This was harder than I thought because so many of the ideas were for children or married couples with children. Pickings were slim for the young, married and child-less. So, we brainstormed and successfully came up with 24 that we both enjoy. I then found quite a few free printable Advent Calendars and a list of bible verses to read each day (plus a Christmas banner) via Pintrest. Here are our ideas. If you have any, I would love to hear them! 16. Deliver Christmas cookies and treats! 24. Read the story of Jesus’ birth. I am so excited about Thanksgiving this year because my in-laws are finally spending a holiday with us. Ok- I will be honest, at first I was a little stir-crazy, and if you ask my husband I still am. Nonetheless hosting anyone for the holidays can be a big to- do, especially when you add a vegetarian who is gluten-free to a couple of true meat and wheat eating southerners. Any-who, here are some tips that will have you hostess-ready in no time! 1. Make a schedule (FOR EVERYTHING)- Seriously, breaking down the cooking, shopping and cleaning by separate days and time give you time to get everything done and allow you to catch your breath at the same time. A schedule also allows for a margin of error. I would also advise to do your best scheduling activities. As a host(ess), your guest will look to you for guidance so I have a few ice breakers or games on hand, just in case the air gets stale or WWIII erupts over football. If you’re guest are coming to you for a few days, have some activities lined up that everyone can enjoy over their visit like going to the movies, hitting Black Friday sales or going to community festival(s). I suggest having all the food prepared and in oven-safe storage at least the day before Thanksgiving. This enables you to actually enjoy the holiday, decrease stress and only leaving warming and plating for the day of. 3. Make it Festive- This can be achieved in a myriad of ways. I racked up at my local Coton Colors tent sale, getting some super-nice Thanksgiving decor for 75% off. If you don’t have a Coton Colors near you and out of time to order online, don’t forget about Home Goods, TJ Maxx, Marshall’s and craft stores for holiday themed or everyday serving trays and dinnerware. I also got some awesome printables and DIY decor ideas from Pintrest. Don’t forget to compile a list of craft items for diy projects so you have all of your supplies. Hope this helps you pull of your holiday without a hitch and design on a dime. I will post my decor pics to my Facebook and Instagram pages. Happy thanksgiving! Dress Making= Sew Cute HIT! So many of you know that me learning how to sew has been a LONG time coming but I finally learned and I am on a roll thanks to a lovely lady having pity on me and taking a lot of time to teach me. 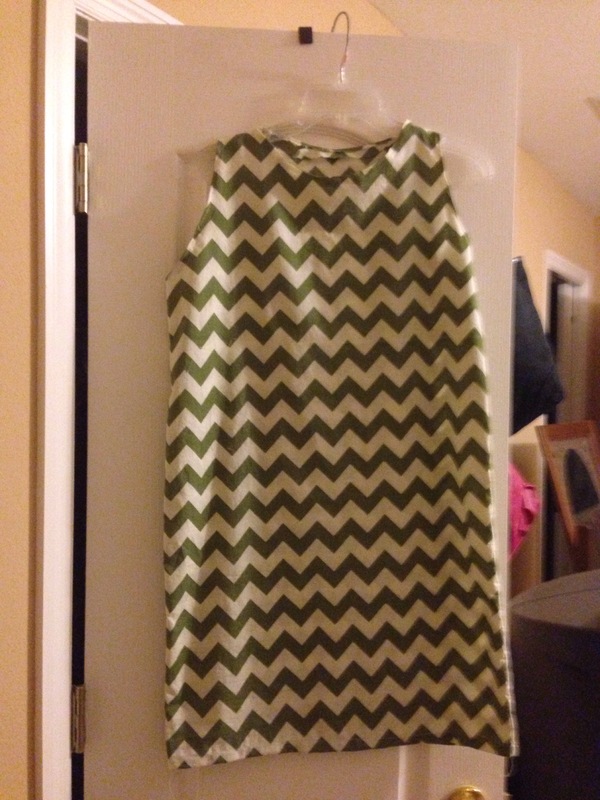 After I finished my first project (a pillow) I jumped right into a new one… a chevron shift dress. First, thanks to the wonders of technology, I was able to find this tutorial online and not have to fool with cutting out a pattern, I Just had to follow the lines outlined from a blousy top onto the fabric. I didn’t do so hot cutting out the neckline lining as indicated in the tutorial and there was some trial-and-error learning…like remembering to put the presser foot down no matter how excited you are. Anyway, here are some pics. I have many more things I want to sew and I’ll be sharing all the hits and misses with you. I got the fabric for $2.97/yard at Wally World. (Joann’s or Hobby Lobby didn’t have it). 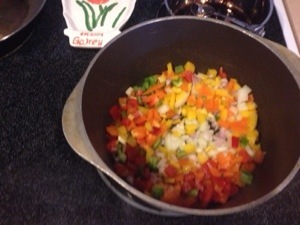 Sautee the garlic, shallots, onion and bell pepper in a dutch over 9or large pot) with olive oil. 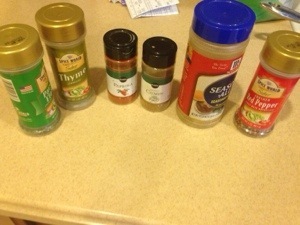 Add in all the cans listed above and then start adding your seasonings. Then let simmer. You want to make sure all the vegetables are soft and very tender. *Optional* Top with jalepenos, cheese and/or green onions. 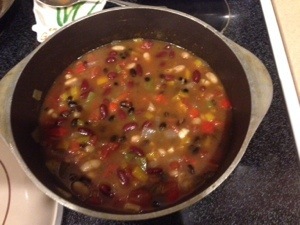 Serve with garlic bread or crackers.